Its Dutdutan time again and we will have a great time again on September 1 and 2, 2017 at the World Trade Center. We will be catching up with artists and lovers alike for the ink world. We would like to highlight the event by showcasing a tattoo lover in the likes of Maribel Esteban. A former FHM and Playmate Model, this girl really loves her inks, so we took away a few moments of her busy schedule to answer a few questions for you our readers. KTG: Who is Maribel in real life? "Maribel is a powerful and extremely magnetic woman. Who was born to lead, plan and orchestrate, more concrete and practical than truly intellectual, she is resourceful, active, dynamic and prepared to fight for accuse that close to her heart, rather self-satisfied. She is frank and direct attitude but deep down Maribel is an affectionate, sensitive and emotional, living in the present moment with such intensity, She is certainly a very passionate Woman." KTG: Those are a lot of words to describe such a great beauty. Now going back to your tattoos, what was your first one? "My 1st tattoo is tiger, a cross and koi fish. I started [in] 2009, I'll never forget this experience. I met these couples Susan and Ruel Patawaran, I was with three best ties April and Drew [and] we catch up for some drinking and we decided to get friendship tattoos, when we were at the tattoo shop, I was exhausted when I started looking for a design [then] all of the sudden I passed out and my session haven't even started. 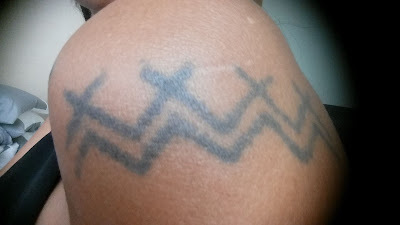 LOL finally in the end I got my 1st tattoo and Susan and Ruel turned out to be my good friends for 9yrs now." Her tats on her arms. KTG: How many tattoos you got so far? "If I counted one by one, the easy thing to say is [that] I got my back covered with tattoos, on my arms I got 6 design, on my left leg a lace , on my right, near my feet it's a cherry blossom what you called in japanese a Sakura. Then I organized a charity [event and] headed to Kalinga Philippines I met [with] Wang od, believed to be the last Mambabatok from the people in Buscalan, so I got old traditional tattoo from Wang od and Grace Palicas." With the legendary Mambabatok Wang Od in Kalinga. The design made by Wang Od on her left shoulder. "Tattoos for me is a Self Expression, My tattoo are actually a story of my life Journey moving from [different] countries , different Settings and experience." 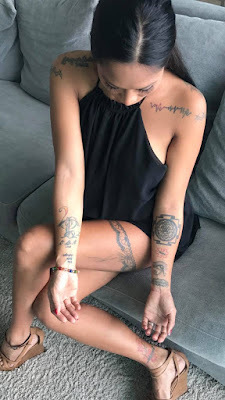 KTG: Would you still go for more tattoos? "I guess I'll add some.LOL Depends how meaningful or a life lesson will be given to me." KTG: How do people react when you see your tattoos? "In my travels, some people give me compliments and admire my tattoos. I've seen men and women with tattoos and it's great. People ask me if getting [a] tattoo is painful. My response is it depends on [one's] pain tolerance. KTG: Would you encourage other people to follow your footsteps? "I never encourage others to do what I have done to my body but one thing I suggest is when they decided to get a tattoo it has to be meaningful and from their heart." To follow her adventures, you may check out her facebook profile here. Photoshoot session showcasing her tattoos.